Eating gluten-free can be challenging, but with a bit of forward planning it's easy to find tasty and safe sustenance. But sometimes - like at 10,000 feet - you're at someone else's mercy. Airline food strikes fear into the heart of many gluten-free diners. Some airlines serve up a fine old feast (with the added bonus that those of us with pesky dietary requirements often get served first). Others produce some mightily strange - and underwhelming - meals when you tick that 'gluten-free' box. Since food on planes can be a fickle beast for allergy eaters, experience has taught me to cram my carry-on bag with snacks on long-haul flights. The Wheaty Eater: sandwich, juice, 'savoury snack' and unidentifiable cookie. First up, we have the Wheaty Eater. After a few hours into the flight, he tore open the lunch bag the air steward gave him and a medley of wheaty treats fell out. Sandwich, orange juice, bag of salty snacks, something round and biscuity...definitely enough carbs to keep the energy levels up, even a whisper-thin sliver of ham for protein. The soggy tomato slice seemed keen to escape the ensemble, but this isn't a bad line-up for the wheatily inclined. 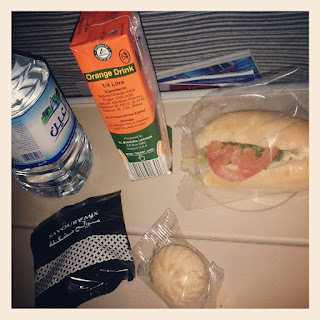 Everything from the sandwich to the 'savoury snack' (which seemed to be nuggets of cracker sprinkled with foul-smelling cumin) was, of course, cooled to that frosty airline temperature. Nonetheless, Wheaty devoured the sandwich in about two bites. Madame Free-From: 500% of your recommended daily vitamin C. And nothing else. One airline I flew with got creative and cling-filmed two rice crackers together in lieu of a sandwich and gave that to me. A filling between those two parched wafers would have staved off the serious feeling of dry-mouth, but I was relieved to get something. (It does happen that I'm sorrowfully told there's nothing for me to eat, even if I've informed the airline way in advance.) Some chilly fruit slices aren't much of a meal although they provided a refreshing detox prior to a week of filling my face with Kuala Lumpur's cuisine. Airline caterers, I know you're under pressure. Quick turnarounds, special diets from gluten-free to kosher to the intriguing 'bland meal' option, it's no simple matter to tick every box. 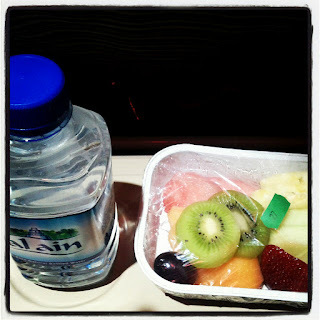 But it's hard not to feel short-changed when you book an expensive flight months in advance and are treated to a meagre fruit salad while the rest of the plane chows down. Rice cakes, dried fruit and nuts, the zillions of gluten-free carbs out there... they all have long shelf-lives and make great substitutes for wheaty meals if you can't cater something gf from scratch. 'Free from gluten' doesn't mean 'free from everything, just in case': why no orange juice? Why do I have to fight to get that yoghurt? And why so often a vegetarian meal? Lumping together everyone's dietary requirements and witholding your dairy, meat and nuts is, well, nuts. Airline catering remains a lucky dip, so for the foreseeable future, my carry-on bag will continue to overflow with bags of M&Ms. And no Wheaty, I won't be sharing. Which airlines do you think are the best for gluten-free diners? 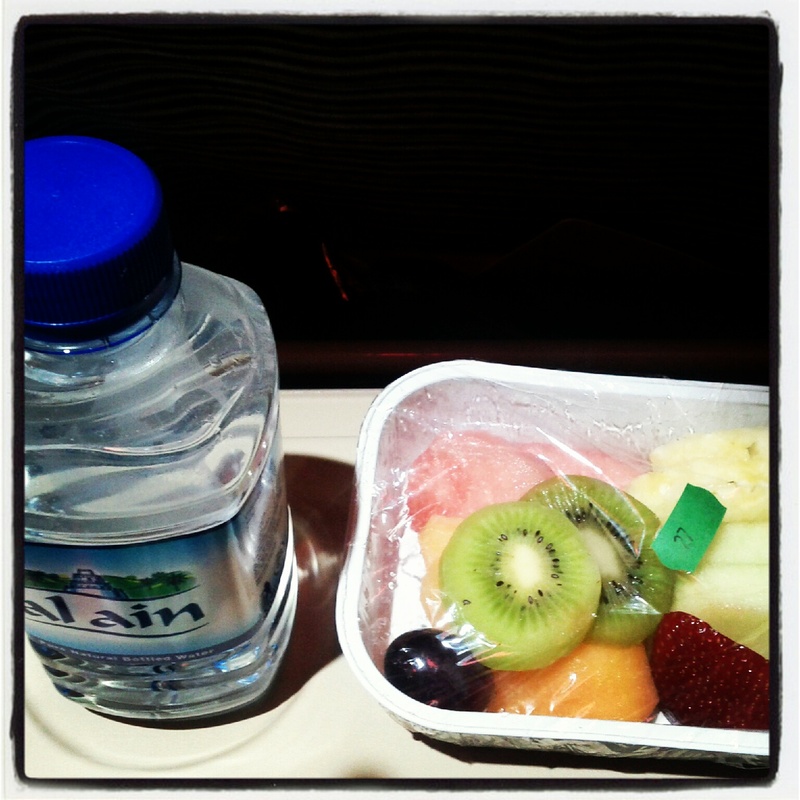 And what is the most meagre gluten-free meal you've had on a flight?